ICQ (or 'I Seek You') instant messaging service is used by millions worldwide to make the complicated work of finding friends, colleagues and people with similar interests, as straightforward as calling across a room and starting a friendly conversation. With ICQ Instant Messenger you can customize your ICQ to be exactly what you need and always up-to-date by adding shortcuts to your favorite features in order to launch them directly from your ICQ. This means that you can send your friends & contacts greeting cards and invitations to games, multi chats, video sessions, and more directly from your client and/or the message window. 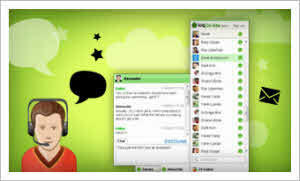 In the message window you can also choose to display your photo or one of ICQ's unique, animated devils.